Great Taste, the world’s most coveted blind-tasted food awards, which celebrates the very best in food and drink, has announced the Great Taste stars of 2016. 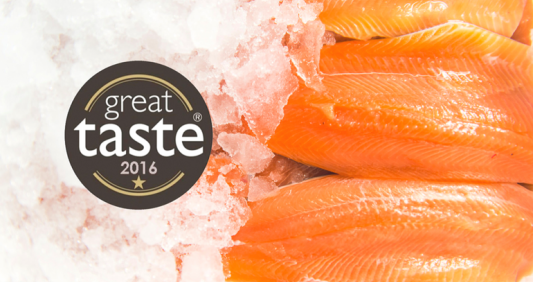 Out of 10,000 products to be judged, Trafalgar Fisheries was awarded a 1-star Great Taste award for its Trout Fillets. One judge commenting they found the fillets Juicy and full flavoured. A lovely natural river bed layer of flavour and some complexity on the finish. Judged by over 500 of the most demanding palates, belonging to food critics, chefs, cooks, restaurateurs and producers as well as a whole host of food writers and journalists, Great Taste is widely acknowledged as the most respected food accreditation scheme for artisan and speciality food producers. As well as a badge of honour, the unmistakeable black and gold Great Taste label is a signpost to a wonderful tasting product, which has been discovered through hours and hours of blind-tasting by hundreds of judges. Recognised as a stamp of excellence among consumers and retailers alike, Great Taste values taste above all else, with no regard for branding and packaging. Whether it is bread, honey, salami or cereal being judged, all products are removed from their wrapper, jar, box or bottle before being tasted. The judges then savour, confer and re-taste to decide which products are worthy of a star award. There were 10,000 Great Taste entries this year and of those products, 141 have been awarded a 3-star, 878 received a 2-star and 2,520 were awarded a 1-star accolade. The panel of judges included; TV chef and author, Valentine Warner, MasterChef judge and restaurant critic, Charles Campion, fifth generation baker, Tom Herbert from Hobbs House Bakery, and Great British Bake Off winner, Frances Quinn; food buyers from Harrods, Selfridges, Fortnum & Mason, Harvey Nichols and Waitrose and chefs including, James Golding, chef director of THE PIG Hotels, and Kevin Gratton, chef director of HIX Restaurants.